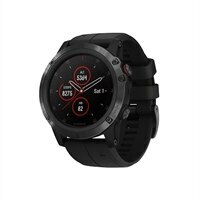 Garmin fenix 5X Plus Sapphire GPS/GLONASS/Galileo watch Hiking, Running, Swimming 1.2 inCombining world-class performance with the best features of Garmin's fitness and outdoor watches, fenix 5X is the premiere multisport training companion. It's the first fenix series watch to offer full-color TOPO U.S. mapping for at-a-glance navigation and location reference - so you can beat yesterday, and be sure of getting back. You get advanced features such as Elevate wrist heart rate technology, built-in activity profiles, performance metrics and training status readings that show the fitness-enhancing effects of your workout. Smart notifications help you stay in touch on the go. Plus, QuickFit bands let you tailor the look to any lifestyle or activity - no tools required. Go from workplace to workout without breaking stride. The fēnix 5X multisport watch features a protective PVD-coated stainless steel bezel and buttons and a reinforced housing for extra durability. Each watch is water-rated to 100 meters and features advanced GPS and GLONASS satellite reception to track in more challenging environments than GPS alone. You can count on long battery life in each mode of operation (varies by model, depending on settings). A bright, high-resolution, full-color Garmin Chroma Display with LED backlighting assures great readability in all ambient conditions - from harsh daylight to dim lighting. Transflective technology that reflects and transmits light at the same time enables the watch face to become even more readable under intense sunlight. The Sapphire edition features a scratch-resistant sapphire lens and is also Wi-Fi-enabled so your watch can connect to your wireless network and automatically send activity uploads for sharing on Garmin Connect. Whether you're in the city or on the trail, an array of fēnix 5X on-watch mapping and navigation features help keep you oriented and on-course at a glance. Round-trip Run and Round-trip Ride routing options give runners and cyclists the ability to enter a distance they want to travel and have the watch suggest appropriate courses. Easy-to-read guidance cues provide banners on the display that show upcoming turns. Around Me map mode displays locations nearby in a simplified graphical interface that increases awareness and ease when navigating in unfamiliar environments. Just how effective is your current training plan? fēnix 5X will help you monitor your training and recovery so you can better prepare for a race or training cycle. Training status is an innovative performance monitoring tool that automatically evaluates your recent exercise history and performance indicators to let you know if you're training productively, peaking or overreaching. The anaerobic training effect metric opens a window of insight to a critical dimension of training, telling you how your training is improving your ability to push the limits. You can even view your overall training load, which measures your exercise volume from the last 7 days and compares it to the optimal range for your fitness and recent training history. Let fēnix 5X measure crucial running metrics that you can use to analyze your performance. Biomechanical measurements such as cadence, stride length, ground contact time and balance, vertical oscillation and vertical ratio are the key to understanding your form so you can bring your best on race day. These metrics are available with the addition of a compatible heart rate strap or the compact Running Dynamics Pod, which clips right onto your waistband. Also, take advantage of feature sets to help with cycling and even swim training. In the water, fēnix 5X will track your distance, pace, stroke count and more. Beyond their running functions, fenix 5 watches also offer special feature sets to help with swim training, skiing, golfing and paddle sports, including stand-up paddle boarding and rowing. For swimmers, the device tracks your distance, pace, stroke count and more. Ski/Board mode puts speed, distance, vertical drop and an automatic run counter (with Auto Pause for the lift line) and more at your fingertips. The feature set for paddle sports includes stroke count, stroke rate and even distance per stroke. Golf mode gives you yardage to the front, back and middle of the green for any single course you've downloaded from Garmin Connect - and also adds enhancements such as stat tracking (fairways hit, etc. ), Green View, AutoShot detection and auto measure. Each model in the fēnix 5 series provides comprehensive navigation and tracking to guide you on and off the beaten path using GPS plus ABC (altimeter, barometer and compass) sensor capabilities. The built-in altimeter provides elevation data to accurately monitor ascent and descent, while the barometer can be used to predict weather changes by showing short-term trends in air pressure. The 3-axis electronic compass keeps your bearing, whether you're moving or not. In addition, there's an internal gyroscope to help improve position accuracy (and battery life) in UltraTrac mode - as well as a thermometer to help you monitor changing weather conditions. Combining world-class performance with the best features of Garmin's fitness and outdoor watches, fenix 5X is the premiere multisport training companion. It's the first fenix series watch to offer full-color TOPO U.S. mapping for at-a-glance navigation and location reference - so you can beat yesterday, and be sure of getting back. You get advanced features such as Elevate wrist heart rate technology, built-in activity profiles, performance metrics and training status readings that show the fitness-enhancing effects of your workout. Smart notifications help you stay in touch on the go. Plus, QuickFit bands let you tailor the look to any lifestyle or activity - no tools required. Go from workplace to workout without breaking stride.